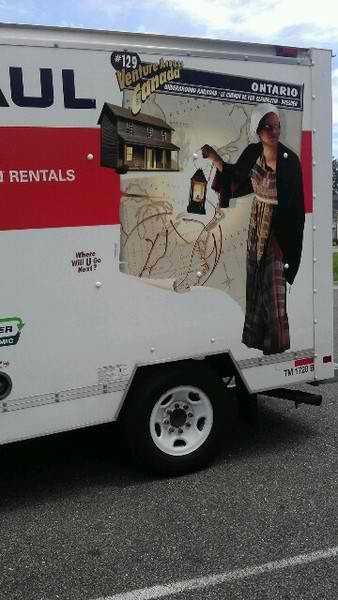 This is the Uhaul truck I was provided with to embark on my new journey. I looked at it wondering should I be offended? I didn’t feel odd driving, loading, or unloading this truck, I was glad to be moving on. I wondered though if the white man who rented this truck after me felt akward pushing around a runaway slave! Time comes in one’s life where one must move on. I was so glad to be leaving the 18th Century mindset of Alabama. I attended college there, and immediately found a job after graduation. Small town with an even smaller mentality. I tried my best to leave, for three years, and I’ve finally made it out. It felt like I was stuck-you know that feeling when you walk into a spider web and can’t get it off of you. I did everything I could to escape the reality of living there, I left every weekend heading to a city much bigger, with more things to offer. Getting pink slipped from my job gave me the blessing I needed to escape that time warp! After getting another job in a city more northern than Alabama, it was only befitting that I use the Uhaul truck with the runaway slave headed to Canada for freedom. Odd paralleism to my escape from the South. My plan is to eventually reach New York or Chicago, and I’m almost there. It might take another 3 years, but as long as it happens I’m okay! On another note—should black people be bothered by this image floating across the United States? It doesn’t bother me, but I wondered if it should. Just a bit of the Truth!